The oxidation state, often called the oxidation number, is an indicator of the degree of oxidation (loss of electrons) of an atom in a chemical compound. Conceptually, the oxidation state, which may be positive, negative or zero, is the hypothetical charge that an atom would have if all bonds to atoms of different elements were 100% ionic, with no covalent component. This is never exactly true for real bonds. The term "oxidation" was first used by Lavoisier to signify reaction of a substance with oxygen. Much later, it was realized that the substance, upon being oxidized, loses electrons, and the use of the term "oxidation" was extended to include other reactions in which electrons are lost. The increase in oxidation state of an atom, through a chemical reaction, is known as an oxidation; a decrease in oxidation state is known as a reduction. Such reactions involve the formal transfer of electrons: a net gain in electrons being a reduction, and a net loss of electrons being an oxidation. For pure elements, the oxidation state is zero. There are various methods for determining oxidation states. In inorganic nomenclature, the oxidation state is determined and expressed as an oxidation number, and is represented by a Roman numeral placed after the element name. In coordination chemistry, "oxidation number" is defined differently from "oxidation state". the algebraic sum of oxidation states of all atoms in a neutral molecule must be zero, while in ions the algebraic sum of the oxidation states of the constituent atoms must be equal to the charge on the ion. There are two different methods for determining the oxidation state of elements in chemical compounds. First (and widely taught) a method based on the rules in the IUPAC definition (see above). Second, a method based on the relative electronegativity of the elements in the compound, where the more electronegative element is assumed to take the negative charge.
) has an oxidation state of +1. The sum of oxidation states for all atoms in a molecule or polyatomic ion is equal to the charge of the molecule or ion. Thus, the oxidation state of one element can be calculated from the oxidation states of the other elements. 2. Oxygen is assumed to have its usual oxidation state of −2, and so the sum of the oxidation states of all the atoms can be expressed as x + 2(−2) = 0, or x − 4 = 0, where x is the unknown oxidation state of carbon. Thus, it can be seen that the oxidation state of carbon in the molecule is +4. 4. As indicated by the formula, the total charge of this ion is −2. Because all four oxygen atoms are assumed to have their usual oxidation state of −2, and the sum of the oxidation states of all the atoms is equal to the charge of the ion, the sum of the oxidation states can be represented as y + 4(−2) = −2, or y − 8 = −2, where y is the unknown oxidation state of sulfur. Thus, it can be computed that y = +6. These facts, combined with some elements almost always having certain oxidation states (due to their very high electropositivity or electronegativity), allows one to compute the oxidation states for the remaining atoms (such as transition metals) in simple compounds. 3, oxygen has an oxidation state of −2 (no fluorine or O−O bonds present), and hydrogen has a state of +1 (bonded to oxygen). So, each of the three hydroxide groups has an overall oxidation state of −2 + 1 = −1. As the compound is neutral, chromium has an oxidation state of +3. The use of electronegativity in this way was introduced by Linus Pauling in 1947. This method of determining oxidation state is found in some recent text books. This method allows the oxidation state of all atoms in a molecule to be determined whereas the IUPAC 1990/2005 definition does not. In the 1970 rules, IUPAC recommended that oxidation state be used in nomenclature and elsewhere in inorganic chemistry as the "charge that would be present on an atom if the electrons were assigned to the more electronegative atom", but with a convention that hydrogen is considered to be positive in combination with nonmetals and a bond between like atoms makes no contribution to the oxidation number. In practice the IUPAC 1990/2005 definition is usually extended by adding additional rules based on electronegativity. Fluorine has an oxidation state of −1 when bonded to any other element, since it has the highest electronegativity of all reactive elements. Halogens other than fluorine have an oxidation state of −1 except when they are bonded to oxygen, to nitrogen, or to another halogen that is more electronegative. For example, the oxidation state of chlorine in chlorine monofluoride (ClF) is +1. However, in bromine monochloride (BrCl), the oxidation state of Cl is −1. 4, where each H has an oxidation state of −1. 2), where oxygen has an oxidation state of −1. 3 with nitrogen oxidation states of −3 and +5 respectively. This method can be used for molecules when one has a Lewis structure. It should be remembered that the oxidation state of an atom does not represent the "real" charge on that atom. This is particularly true of high oxidation states, where the ionization energy required to produce a multiply positive ion are far greater than the energies available in chemical reactions. The assignment of electrons between atoms in calculating an oxidation state is purely a formalism, but is a useful one for the understanding of many chemical reactions. When a Lewis structure of a molecule is available, the oxidation states may be assigned by computing the difference between the number of valence electrons that a neutral atom of that element would have and the number of electrons that "belong" to it in the Lewis structure. For purposes of computing oxidation states, electrons in a bond between atoms of different elements belong to the more electronegative atom; electrons in a bond between atoms of the same element are split equally, and electrons in a lone pair belong only to the atom with the lone pair. Following the same rules, the carboxylic acid carbon atom gets the other one valence electron from the C−C bond. None of its other valence electrons are counted here because they are involved in bonding to oxygen atoms, which are more electronegative than carbon. For a carbon with one electron, the oxidation state is +3, again calculated against its neutral four-electron count. The oxygen atoms each have an oxidation state of −2; they get 8 electrons each (4 from the lone pairs and 4 from the bonds), while a neutral oxygen atom would have 6. The hydrogen atoms each have oxidation state +1, because they surrender their electron to the more electronegative atoms to which they are bonded. In structural diagrams for organic chemistry, oxidation states are represented by Roman numerals to distinguish them from formal charges (calculated with all bonds covalent). 3), for which the algebraic sum rule yields the average value +2 for sulfur, where the two ionizing electrons are assigned to the terminal sulfur atom. However, the use of a Lewis structure and electron counting shows that the two sulfur atoms are different. 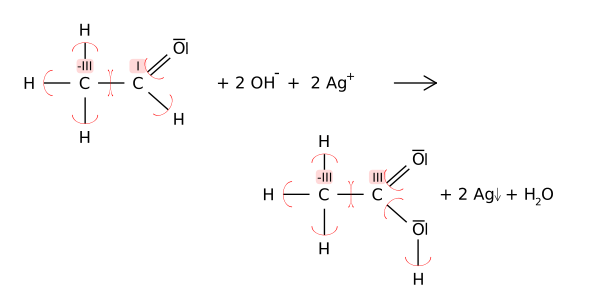 The central sulfur is assigned only one valence electron from the S−S bond and no valence electrons from the S−O bonds, compared to six valence electrons for a free sulfur atom, so the oxidation state of the central sulfur is +5. The terminal sulfur atom is assigned the other electron from the S−S bond plus three lone pairs for a total of seven valence electrons, so its oxidation state is −1. Oxidation states can be useful for balancing chemical equations for oxidation–reduction (or redox) reactions, because the changes in the oxidized atoms have to be balanced by the changes in the reduced atoms. For example, in the reaction of acetaldehyde with the Tollens' reagent to acetic acid (shown below), the carbonyl carbon atom changes its oxidation state from +1 to +3 (oxidation). This oxidation is balanced by reducing two equivalents of silver from Ag+ to Ag0. 3, with the first and third carbon atoms each having an oxidation state of −3 and the central one −2. 2. The diatomic superoxide ion has an overall charge of −1, so each of its two oxygen atoms is assigned an oxidation state of − 1⁄2, This ion can be described as a resonance hybrid of two Lewis structures, where each oxygen has oxidation state 0 in one structure and −1 in the other. 5, the oxidation state of C is (−1) + (− 1⁄5) = − 6⁄5. The −1 occurs because each C is bonded to one hydrogen atom (a less electronegative element), and the − 1⁄5 because the total ionic charge of −1 is divided among five equivalent C.
3) has oxidation state −3 also but a formal charge of zero. On protonation of ammonia to form ammonium, the formal charge on nitrogen changes, but its oxidation state does not. In the nomenclature of inorganic compounds, the oxidation number is represented by a Roman numeral. The oxidation number is equal to the oxidation state using the rules, although they acknowledge other methods can be used. Oxidation numbers must be positive or negative integers, fractional oxidation numbers should not be used, and in the event of any uncertainty alternative naming conventions should be used. 4, is represented as iron(II,III) oxide, showing the mixture of oxidation states of the nonequivalent iron atoms. While oxidation state and oxidation number are often used interchangeably, oxidation number is used in coordination chemistry with a slightly different meaning. In coordination chemistry, the rules used for counting electrons are different. Every electron in a metal–ligand bond belongs to the ligand, regardless of electronegativity, so that the oxidation number is the charge that would remain if all ligands were removed together with the electron pairs shared with the central atom. Of a central atom in a coordination entity, the charge it would bear if all the ligands were removed along with the electron pairs that were shared with the central atom. It is represented by a Roman numeral. 3 (Ph = phenyl), in which the rhodium atom is more electronegative than phosphorus. Nevertheless, the oxidation number of rhodium in this molecule is considered to be +1 and the molecule's systematic name is chlorotris(triphenylphosphine)rhodium(I), as the electrons of each Rh−P bond are assigned to the P atom of the ligand. The electronegativity rule would assign them instead to the Rh with an oxidation state of −5. Although oxidation numbers can be helpful for classifying compounds, they are unmeasurable and their physical meaning can be ambiguous. Oxidation numbers require particular caution for molecules where the bonding is covalent, since the oxidation numbers require the heterolytic removal of ligands, which in essence denies covalency. Spectroscopic oxidation states, as defined by Jorgenson and reiterated by Wieghardt, are measurables that are benchmarked using spectroscopic and crystallographic data. Oxidation state can also have effect on spectroscopic studies of compounds. In infrared spectroscopy of metal carbonyls this effect is illustrated by using spectroscopic studies on metals from oxidation states of −2 to +2. Unusual oxidation states of metals are important in biochemical processes, the notable ones being Fe(IV) and Fe(V) in cytochrome P450-containing systems. Oxidation itself was first studied by Antoine Lavoisier, who believed that what we now call oxidation was always the result of reactions with oxygen, thus the name. Although Lavoisier's idea has been shown to be incorrect, the name he proposed is still used, albeit more generally. Oxidation states were one of the intellectual stepping stones that Mendeleev used to derive the periodic table. When it was realized that some metals form two different binary compounds with the same nonmetal, the two compounds were often distinguished by using the ending -ic for the higher metal oxidation state and the ending -ous for the lower. For example FeCl3 is ferric chloride and FeCl2 is ferrous chloride. This system is not very satisfactory (although sometimes still used) because different metals have different oxidation states which have to be learned: ferric and ferrous are +3 and +2 respectively, but cupric and cuprous are +2 and +1, and stannic and stannous are +4 and +2. Also there was no allowance for metals with more than two oxidation states, such as vanadium with oxidation states +2, +3, +4 and +5. 2 is called iron(II) chloride rather than ferrous chloride. The current concept of "oxidation state" was introduced by W. M. Latimer in 1938. In 1940 IUPAC recommended that the term Stock number should be replaced by the term oxidation number. In 1947 Linus Pauling proposed that the oxidation number could be determined using the electronegativity of the atoms to determine the "ions" in the formal determination of oxidation number. In 1970 IUPAC defined oxidation number in terms of electronegativity. In 1990 IUPAC changed course and adopted a rule based determination for the "central atom" rather than using electronegativity. This is the definition in the current Gold Book for "oxidation state". They also introduced the definition of oxidation number, shown in the current Gold Book, that appears to make oxidation number specific to coordination chemistry. This may not have been their intention, as in 2005 they issued new recommendations for inorganic nomenclature that define oxidation number in the same terms as the 1990 definition of oxidation state, and that oxidation number is, as in the earlier recommendations, used in the naming of inorganic compounds. In general, in the wider field of chemistry the IUPAC definitions have not been adhered to and both terms are used interchangeably, as they were when Latimer introduced the concept in 1938. For example, two well-known textbooks use the term oxidation state and represent it in Roman numerals in chemical formulae. The point has been made that, if there is any semantic difference between the terms, then oxidation number refers to the specific numerical value assigned to the entity known as oxidation state, much as IUPAC use the term charge number to refer to the numerical value assigned to the entity known as ionic charge. The IUPAC Gold Book takes the definitions from 1990 IUPAC papers rather than the more recent current IUPAC 2005 recommendations. An IUPAC project, "Towards a comprehensive definition of oxidation state", (project 2008-040-1-200) started in 2009. The technical report has been published in Pure and Applied Chemistry. The project was undertaken because the current definition in the IUPAC Gold Book was seen to be "narrow and circular", and "inapplicable to clusters, Zintl phases and some organometallic complexes". ↑ Wang, Guanjun; Zhou, Mingfei; Goettel, James T.; Schrobilgen, Gary G.; Su, Jing; Li, Jun; Schlöder, Tobias; Riedel, Sebastian (23 October 2014). "Identification of an iridium-containing compound with a formal oxidation state of IX". Nature. 514: 475–477. doi:10.1038/nature13795. ↑ Karen, Pavel; McArdle, Patrick; Takats, Josef (2016). "Comprehensive definition of oxidation state (IUPAC Recommendations 2016)". Pure and Applied Chemistry. 88 (10). doi:10.1515/pac-2015-1204. 1 2 Karen, Pavel; McArdle, Patrick; Takats, Josef (2014). "Toward a comprehensive definition of oxidation state (IUPAC Technical Report)". Pure and Applied Chemistry. 86 (6). doi:10.1515/pac-2013-0505. 1 2 Loock, Hans-Peter (2011). "Expanded Definition of the Oxidation State". Journal of Chemical Education. 88 (3): 282–283. doi:10.1021/ed1005213. ISSN 0021-9584. ↑ Spencer J.N., Bodner G.M. and Rickard L.H. Chemistry: Structure and Dynamics (5th ed., Wiley 2010), p.543. This reference uses 1-propanol as an example. ↑ Nomenclature of Inorganic Chemistry IUPAC Recommendations 2005 ed. N. G. Connelly et al. RSC Publishing http://www.old.iupac.org/publications/books/rbook/Red_Book_2005.html. ↑ IUPAC, Compendium of Chemical Terminology, 2nd ed. (the "Gold Book") (1997). Online corrected version: (2006–) "oxidation number". ↑ Bill, E.; Bothe, E.; Chaudhuri, P.; Chlopek, K.; Herebian, D.; Kokatam, S.; Ray, K.; Weyhermueller, T.; Neese, F.; Wieghardt, K. (2005). "Molecular and electronic structure of four- and five-coordinate cobalt complexes containing two o-phenylenediamine- or two o-aminophenol-type ligands at various oxidation levels functional, and correlated ab initio study". Chemistry: A European Journal. 11 (1): 204–224. doi:10.1002/chem.200400850. PMID 15549762. 1 2 Jensen, William B. (2007). "The Origin of the Oxidation-State Concept". Journal of Chemical Education. 84 (9): 1418. doi:10.1021/ed084p1418. ISSN 0021-9584. ↑ Jensen, William B. (2011). "Oxidation States versus Oxidation Numbers". Journal of Chemical Education. 88 (12): 1599–1600. doi:10.1021/ed2001347. ISSN 0021-9584. ↑ Red Book: IUPAC Nomenclature of Inorganic Chemistry. Third Edition, Blackwell Scientific Publications, Oxford, 1990. ↑ Calvert, J. G. (1990). "Glossary of atmospheric chemistry terms (Recommendations 1990)". Pure and Applied Chemistry. 62 (11): 2167–2219. doi:10.1351/pac199062112167. ISSN 0033-4545. ↑ "Project Details: Towards a comprehensive definition of oxidation state". IUPAC. March 10, 2014. Retrieved May 1, 2014.